In addition to numerous benefit activities, school and educational living history presentations, and our reenactments, the Lexington Minute Men have marched in the inaugural parades of Presidents Dwight D. Eisenhower, John F. Kennedy, Jimmy Carter, and Bill Clinton. They have also served as Honor Guard for numerous Massachusetts Governors. The Bicentennial visits of President Gerald Ford and Queen Elizabeth and Prince Phillip provided the opportunity for the Company to serve as their honor guard. The Bicentennial reenactment of 1976 was attended by over 18,000 people. The Lexington Minute Men have conducted opening ceremonies for numerous events. 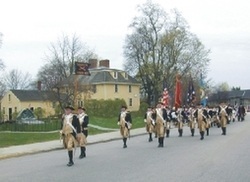 The Minute Men took part in the Rededication of the Battle Green during Patriots’ Day weekend of 2000 and are seen here marching proudly past Buckman Tavern, the meeting place of the militia on April 19, 1775. Also in 2000, the Minute Men participated in Boston’s Tall Ships event — Sail2000. As seen here, led by Captain Loran Logan, the Company paraded on the flight deck of the U.S.S. John F. Kennedy aircraft carrier as part of its participation in the Sail2000 activities. Through various fundraising activities, the Lexington Minute Men have been able to subsidize projects such as the sculpting and installation of the Minute Men Memorial (pictured here) on the grounds of Buckman Tavern. The Minute Men continue to honor those from Lexington who fought in the Revolutionary War. Here Captain Loran J. Logan presents memorial wreaths honoring two Revolutionary War veterans from Lexington, Corporal Ebenezer Parker and Thomas Parker, at their Parker Cemetery gravesites in Princeton Massachusetts where they moved after the Revolutionary War. The Lexington Minute Men also traveled to Arlington National Cemetery in June of 2000 where they performed a wreath-laying ceremony at The Tomb of the Unknowns, and a tree planting and marker dedication in Arlington National Cemetery in memory of the eight men who died on the morning of April 19, 1775 — the first casualties of the American fight for Independence. In September of 1999 and again in September, 2009 the Company traveled to Lexington’s sister-city, Antony, France for the initial dedication and then rededication of a monument erected in honor of the firing of the first shot of the American Revolution in Lexington on April 19, 1775. General Le Marquis de Lafayette visited Lexington in 1824 and met with some of the veterans of the engagement of April 19, 1775. Thus it was a great honor during this visit to also participate in a moving ceremony at his gravesite in Paris. The Minute Men are grateful to the American Battlefields Monuments Commission for granting us permission during this visit to lay a wreath at the Normandy American Military Cemetery and Memorial. "In remembrance of the firing of the first shot of the American Revolution 19th of April, 1775 at Lexington (Massachusetts) and of the friendship with our sister city.